I know it sounds cliche, but furniture speaks to me. No, I’m not crazy, I don’t really hear voices in my head. But I like to get a feel for a piece of furniture before I decide how to paint it. This one wanted to be indigo. Like the Pottery Barn catalog I showed you earlier. This was the intended recipient of my mixology experiment. It didn’t quite get there. It’s a bit darker than I imagined, which is totally my fault because I finished with hemp oil and I should have waxed. I’d even purchased the Miss Mustard Seed wax just for this piece, so why did I reach for the hemp oil? Was I tired? Was it that glass of wine I had with dinner? I don’t know … but it is what it is. You can see that I got plenty of chipping on this piece. I also sanded off a lot more paint than I intended. Blame that on the wine too, although the reality is you can blame it on working at night with inadequate lighting and the impaired vision of someone in my age bracket. I have found that even with ‘cheaters’ sometimes my vision just doesn’t cut it at night anymore. This chippy distressed look is exactly what I like, but I know it’s not for everyone. Hopefully I will find a buyer who loves it too. I think in the right room it would be a masterpiece. Add some more touches of indigo in some throw pillows or bed linens. Lovely. I can see the indigo better in that last photo the pic on the left. Your ad is a definite standout from all the rest. Very handsome piece Linda. Thanks Victoria! I found it rather difficult to truly capture the color in the pics. I definitely don’t think it has as much green in person as it did in my mixology pictures. In hindsight, I should have mentioned in my craigslist ad that the color is like a nice dark wash pair of jeans, it works as a neutral and could be paired with most any other color. This piece turned out absolutely beautiful. I can’t tell you how much I like it. I have a Victorian Cottage piece upstairs, where I live, that has the original black paint (not indigo, I know) on it and I couldn’t bring myself to put it in the shop. Your piece is an absolute steal at 225.00. 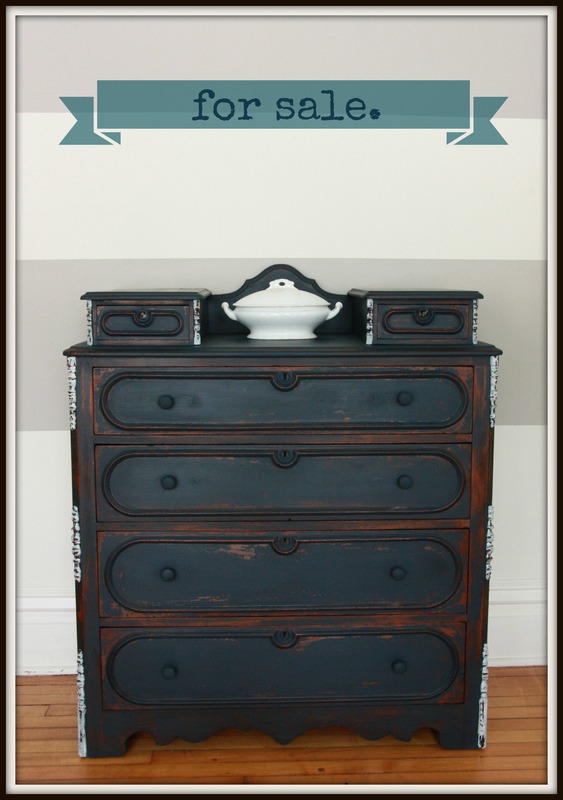 The quality wood and construction of that dresser will last another 130 years and then some. Ikea can’t do this! Pottery Barn can’t do this! I was just looking at it again. Oh, I love the color. Thanks so much for your comments Ginene! I hope a buyer out there recognizes it for the steal that it is, lol. I agree with you totally, they don’t make ’em like this anymore, which is one big reason to buy vintage. 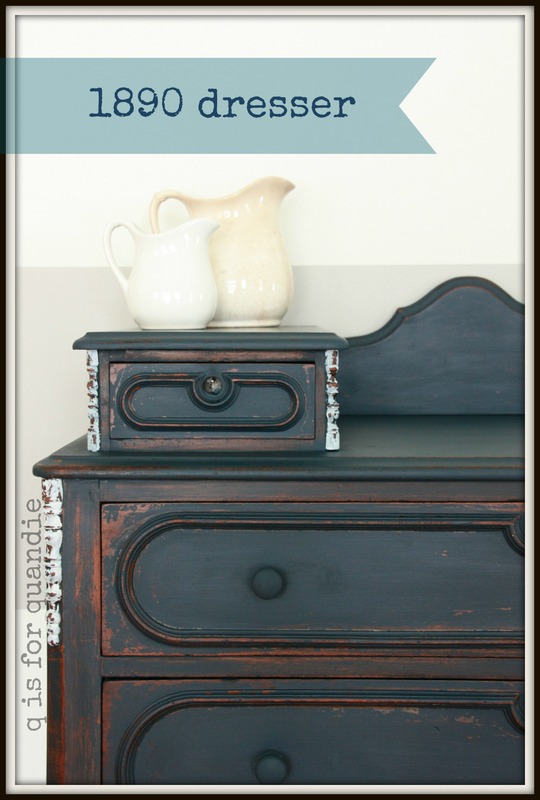 This dresser came out beautiful! Artissimo is one of my favorite colors and it suits this piece perfectly! How do you do on Craigslist? I haven’t tried selling, only buying. Hi Delia! I think I do pretty well on craigslist. Most of my stuff sells fairly quickly, and most everything sells eventually. Although I don’t normally get prices nearly as high as one can get in a shop. I find that there are plenty of savvy shoppers out there on CL looking for unique and affordable pieces for their homes. I have had mainly positive experiences with it. I have had one or two somewhat strange encounters, but not dangerous. One buyer once asked me if I ‘made’ a vintage vanity table myself, and I honestly didn’t know how to respond to that, “no, I wasn’t actually born yet in the 20’s” didn’t seem appropriate somehow. I jest, but yes, overall it works pretty well for me. Thanks CJ. And can I say how thrilled I am to have a reader in the UK. Is that totally dorky of me?